Sometimes you wonder about things. Strange things. I’ve been watching the stepper motor row in the vending machine, and seeing motors quickly disappear. I wonder where they go. It seemed like yesterday we had a huge box of them. Mostly, I don’t know what happens to them. They go to live a second or maybe third life somewhere, in some project. The machine is just a temporal stop in their exciting life of spin and step. Sometimes though, people bring their projects in, and we get a peek at their new function and snap a blurry picture. 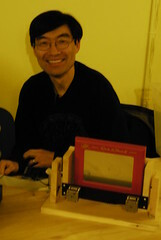 A few weeks ago, Michael came by to show us his propeller powered etch-a-sketch. We were all amazed. We boggled at the speed, accuracy and awesomeness of this project, then we wondered how he did it. Now we know. He’s detailed every gory detail (including source) of the propetcher here. It’s also up on Hackaday, which has some less blurry pictures than our Flickr stream, as well as the normal flurry of helpful suggestions from the peanut gallery. If you’ve been curious how to drive our 3 wire steppers, Michael has also produced this very helpful diagram.